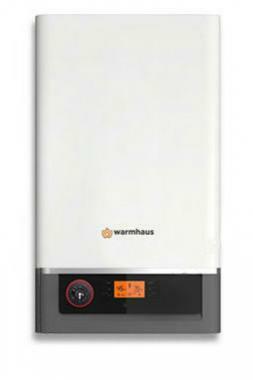 The Enerwa Plus 40kW is a highly reliable condensing Combi gas boiler that’s been designed and manufactured by Warmhaus. With an efficiency rating of 91% and an ErP A rating for heat and hot water, this is a highly efficient unit that will help you to save money on your energy bills. It also boasts a flow rate of 16.3 litres per minute. This model has an output rating of 40kW, which is perfect for homes with 2 or more bathrooms that have a higher demand for heating and hot water. If you don’t require such a powerful unit, the range also includes 31kW and 35kW models. The unit itself is extremely compact, with width of just 288mm which allows the boiler to fit in the narrowest of places and can be housed anywhere, from kitchens to balconies. Within the compact unit are a host of features that will help to benefit your home. Continuous productivity of up to 108%, lower gas and lower electricity consumption, stainless steel heat exchanger, double-tap feeding hot water capacity, low heat loss, quiet operation, an insulated body, gas adaptive control system and 8 litre expansion tank are just a few of the features within the Enerwa Plus. It’s available as a natural gas boiler or LPG unit that both have temperature sensitivity, 1:10 modulation with high savings, an electronic control power pump with strong and quiet circulation, an LCD control panel to give you maximum control over the unit. As a Combi boiler, it’s great for smaller properties as they don’t require an external water tank or cylinder since everything is wrapped up into one cost-effective unit. This makes Combi boilers perfect for homes where space is limited. Available with a 2 year warranty, you’ll have the peace of mind that this unit isn't going to let you down.